Marine approved pressure transmitter with 4-20mA current loop output for shipbuilding with optional CuNiFe housing for sea-water compatibility in ranges from -1 to 600 bar gauge or absolute. The DMK 457 marine approved pressure transmitter has a ceramic sensing diaphragm which is compatible with sea water and salt spray when the copper nickel alloy option is specified for ranges up to 100 bar. The DMK457 marine approved pressure transmitter is LR (Lloyd´s Register), GL (Germanischer Lloyd), DNV (Det Norske Veritas), ABS (American Bureau of Shipping) and CCS (China Classification Society) approved for marine use and can be used above and below deck on seawater systems. ATEX and IECEx approved for intrinsically safe use in hazardous environments is also available for ship systems which are handling flammable and volatile chemicals such as oil, gas, liquid petroleum gas (LPG) and liquid natural gas (LNG). Measure the pressure of seawater on a reverse osmosis desalination plant which is used to convert salt water to fresh water. Monitor seawater pressure in an onboard fire sprinkler system. Monitor pressures on the external side of a offshore wind turbine and withstand submersion in seawater or exposure to salt air & sea spray. Are the fluoroelastomer FKM seals resistant to seawater? Yes the option for FKM seals used in the construction of the DMK457 are compatible with seawater. What is the difference between the TR0 and TS0 submersible options? TR0 is a IP68 rated cable gland but it is not intended for deep permanent submersible applications, but more for cleaning & flood protection. The TS0 is a more robust IP68 cable gland suitable for continuous submersible applications to a depth of 250 metres. Can the DMK457 withstand vibration? Yes the DMK457 is designed to withstand 4g level of vibration as part of the marine approval according to GL: curve 2, according to DNV: Class B and basis: IEC 60068-2-6. I’m looking for a 4-20 mA sea water suction & pressure transducer for measuring -1 to 4 bar on fire, bilge and ballast pumps on a sea vessel? 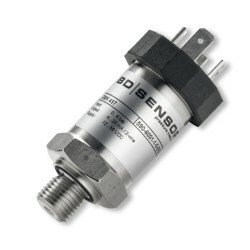 The BD Sensor DMK 457 can be specified for seawater compatibility if configured with the optional CuNi10Fe1Mn housing & process connector. It is also possible to scale the DMK 457 as a compound range with 4mA output at -1 bar and 20mA output at +4 bar. We have a exhaust gas cleaning system, and require a pressure transmitter for the cooling system which has seawater going through it. 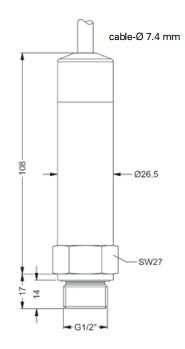 The range is 0-10 bar, output 4-20mA, and we will need the pressure transmitter to be DNV certified. The DMK457 is seawater compatible if specified with the Copper Nickel alloy pressure port. As standard the DMK457 is DNV marine approved for use on ship systems. What kind of cable coating is on the IP68 version of the DMK458? The cable used is TPE coated. 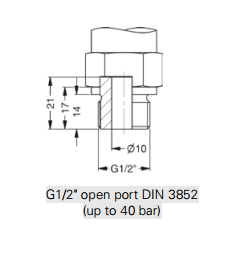 The DMK457 marine approved pressure transmitter has two types of IP68 rated cable gland TRO and TTO? what is the difference between these two types? The TRO version is designed for temporary submersion to protect from flooding or wash down and has been test to 4 bar over 24 hours. The TT0 version is designed for permanent submersion and is suitable to install in depths down to at least 250 mH2O ~ 25 bar. We are looking for a pressure sensor for dredger suction monitoring. It will be mounted on a 50mm branch pipe off the main dredge suction pipe. The sensor will be subject to vibration and there will be sand and gravel in the dredge pipe? 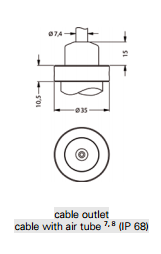 The DMK 457 has the option to measure suction pressure with a 0 to minus 1 bar gauge, and a open pressure port design to prevent clogging whilst protecting the diaphragm from direct abrasion due perpendicular flow. We have a mooring connection that is underwater all the time. We want to know the position of this mooring connection within the range it moves vertically from the sea bed to the surface where it connects. The depth we will be working in is 50 metres and the idea is to install this sensor somewhere on the mooring connection to measure this. The sensor body will be located inside the mooring connection in a dry environment, just the sensing part will be exposed to seawater all the time. What would be a suitable spec for us to use? The DMK 457 can be manufactured so that the whole construction is compatible with seawater, so it will be protected from seawater on the inside and the outside of the mooring connection, which maybe useful if there is a risk of seawater leaks or flooding. I am looking to specify a sensor with a 0-4bar pressure range, which is DNV or Lloyd approved, that is suitable for use on sea water. The DMK457 is DNV/GL approved, and is compatible with seawater if CuNi10Fe1Mn is selected as the process connection material. 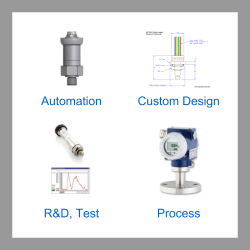 Please select the options you require for the DMK457 Marine Approved Pressure Transmitter in your application and request a quote. Send us your enquiry for DMK457 Marine Approved Pressure Transmitter to get assistance with this product type.